Santa Cruz County Supervisor John Leopold spoke at a brief program and shared his experience with his family's Nissan Leaf, the County's commitment to expanding EV charging stations, and the importance of plug in vehicles to reducing greenhouse gas emissions. He also awarded 30 Recognition Certificates to people and organizations for their contributions to the region's plug-in vehicle readiness. Also attending were: Richard Stedman, head of the Monterey Bay Region Air Pollution Control District, general managers of Salinas Toyota and Chevrolet of Watsonville dealerships, 3 local solar companies and a solar array to provide power. We also had a NTS Works' Electric Cargo Bike for test drives - a new product from Neal and Lisa Saiki. Staff of Life Natural Food Market hosted the event in their parking lot. 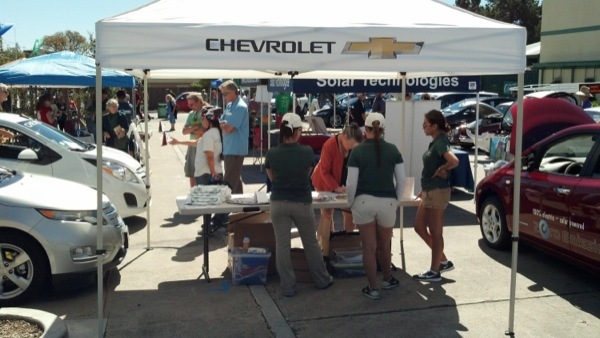 Learn about EVs from actual owners as well as local auto retailers such as Chevrolet of Watsonville, Santa Cruz Toyota, Santa Cruz Nissan, Cardinale Nissan. Santa Cruz County Supervisor & Nissan Leaf EV owner John Leopold will speak, and Special Recognition Awards will be presented at 2 p.m.
Raffle drawing at 3:00 p.m. - donated prizes include $50 Visa gift card from ChargePoint, 2 Segway Tour gift certificates, two 1-day use of an EV through Enterprise Rental, and Tesla merchandise. Learn how to reduce your carbon footprint immediately! A big thank you to our sponsors: Monterey Bay Unified Air Pollution Control District; solar companies: Allterra Solar, Sandbar Solar and Solar Technologies, as well as our in-kind sponsors: Staff of Life Natural Food Market, Santa Cruz Sentinel & Monterey Herald, KUSP, and the Santa Cruz Weekly. From the local organizers: Monterey Bay Electric Vehicle Alliance, Electric Auto Association Central Coast, and Ecology Action.